The recently released CNN iPhone application has embarrassed all the other news applications designed for the iPhone. Although CNN have released their application for the iPhone late, they have truly come up with a master piece. The NPR, Time Magazine and Associated Press, all have applications for the iPhone that are free to download, but their applications are not user friendly. The user is charged $2 for downloading the CNN application from the iTunes Store (presently only available in the U.S.). Although other news applications provide text and photo content, the CNN application for iPhone has broken the barrier with live video streaming (Breaking News) and on demand videos of recent news items. To say that this application has arrived in style is not less. The user is alerted by push messages on the screen when a live newscast is available via the CNN iPhone application. The live breaking reports can be enjoyed over Wi-Fi, EDGE and 3G. Although there will be no advertisements while watching the newscast, advertisements will be shown while the video is loaded. The application is basically divided into four parts, Headlines, My CNN, Videos and iReport. 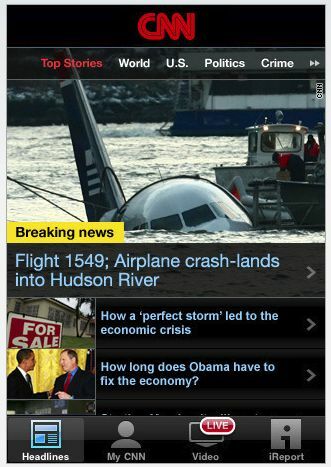 The headlines section is the centre of this CNN application for iPhone and iPod Touch. You can sort the news on the basis of recency and category (politics, crime, sports, etc.). Using the iPhone in the landscape mode allows you to sift through the newscasts via Coverflow. You can also read the breaking news here. You can also share content here via Facebook, Twitter, SMS or email. My CNN is your own personal space. You can save stories here and read them later. Interestingly you do not need an internet connection to view these stories. Another interesting thing about this is that you can use the follow up feature. This feature alerts you whenever a new update is available for the particular story. The video section just keeps becoming better and better. Live streaming videos or recent newscast; you can view them all here. Any time something important happens around the world, such as an election, a natural disaster, etc. is also available in this section. Out of all the section, the iReport section is the most intriguing one. It brings out another perspective called citizen journalism. People can upload videos, photos and stories about what is happening around them. Some of these are even used on actual CNN coverage. The iReport section will allow people of all regions to upload their regional news also. Other than the local news, all other news used in this application is from the CNN website, CNN.com. The local news section uses references to third party sources such as the Chicago Tribune in Chicago. To say that the iPhone application is good would be not fair. For the daily user and especially for the man who travels a lot, this application is a must. Some news companies have been streaming videos live to their respective iPhone applications for free but even with a $2 price tag the CNN iPhone application has done better than all the others. Grab this iPhone and iPod Touch App here.